Pyrazinamide, a derivative of niacinamide, is a synthetic antituberculosis agent. Pyrazinamide is used in conjunction with other antituberculosis agents in the treatment of clinical tuberculosis. The American Thoracic Society (ATS), US Centers for Disease Control and Prevention (CDC), and Infectious Diseases Society of America (IDSA) currently recommend several possible multiple-drug regimens for the treatment of culture-positive pulmonary tuberculosis. These regimens have a minimum duration of 6 months (26 weeks), and consist of an initial intensive phase (2 months) and a continuation phase (usually either 4 or 7 months). Pyrazinamide is considered a first-line antituberculosis agent for the treatment of all forms of tuberculosis caused by Mycobacterium tuberculosis known or presumed to be susceptible to the drug. Pyrazinamide usually is used in the initial phase of treatment of pulmonary tuberculosis. In addition, the drug is included in several multiple-drug regimens used for the management of patients with treatment failure or drug-resistant pulmonary tuberculosis. Although pyrazinamide has been used in conjunction with rifampin for the treatment of latent tuberculosis infection to prevent the development of clinical tuberculosis, especially in individuals exposed to isoniazid-resistant M. tuberculosis, these regimens have been associated with an increased risk for hepatotoxicity and are no longer recommended for most patients. Previously, “preventive therapy” or “chemoprophylaxis” was used to describe a simple drug regimen (e.g., isoniazid monotherapy) used to prevent the development of active tuberculosis disease in individuals known or likely to be infected with M. tuberculosis. However, since use of such a regimen rarely results in true primary prevention (i.e., prevention of infection in individuals exposed to infectious tuberculosis), the ATS and CDC currently state that “treatment of latent tuberculosis infection” rather than “preventive therapy” more accurately describes the intended intervention and potentially will result in greater understanding and more widespread implementation of this tuberculosis control strategy. A 9-month regimen of isoniazid monotherapy (once-daily or, alternatively, twice weekly) generally is considered the regimen of choice for the treatment of latent tuberculosis infection in most adult and pediatric patients and a 6-month regimen of isoniazid monotherapy (once daily or, alternatively, twice weekly) is considered an acceptable alternative in some cases; a 4-month regimen of daily rifampin monotherapy also has been studied and can be considered as an alternative for the treatment of latent tuberculosis in selected individuals. Although a 2-month daily regimen of pyrazinamide and rifampin or a 2- to 3-month regimen of twice-weekly pyrazinamide and rifampin were previously recommended, these regimens have been associated with an increased risk of hepatotoxicity and generally should not be offered for the treatment of latent tuberculosis infection unless the potential benefits outweigh the risk of liver injury and death. Based on results in HIV-infected adults, the ATS and CDC previously recommended use of the 2-month daily pyrazinamide and rifampin regimen for HIV-infected or HIV-seronegative adults who were known contacts of patients with isoniazid-resistant, rifampin-susceptible tuberculosis. However, hepatotoxicity (including some fatalities) has been reported in patients receiving pyrazinamide and rifampin regimens for the treatment of latent tuberculosis and, although multiple-drug regimens containing pyrazinamide and rifampin are still recommended for the treatment of active tuberculosis, the ATS, CDC, and IDSA now state that regimens containing both pyrazinamide and rifampin generally should not be offered for the treatment of latent tuberculosis in either HIV-infected or HIV-negative individuals. The American Academy of Pediatrics (AAP) also states that the 2-month rifampin and pyrazinamide regimen is not recommended for children. Based on a recent analysis of potential cofactors in patients with latent tuberculosis who developed hepatotoxicity while receiving a regimen of pyrazinamide and rifampin, this regimen should never be offered to patients who are currently taking other drugs associated with liver injury, patients who drink excessive amounts of alcohol (even if alcohol is discontinued during treatment), or patients with underlying liver disease or a history of isoniazid-associated liver injury. However, the ATS, CDC, and IDSA state that a pyrazinamide and rifampin regimen might be considered for the treatment of latent tuberculosis in carefully selected patients if the potential benefits of the regimen outweigh the risk for severe liver injury and death, but only when the preferred or alternative regimens (i.e., 9-month isoniazid regimens, 6-month isoniazid regimens, 4-month daily rifampin regimen) are judged unlikely to be completed and oversight can be provided by a clinician with expertise in the treatment of latent tuberculosis. An expert in the treatment of latent tuberculosis should be consulted before a regimen of pyrazinamide and rifampin is offered. If a pyrazinamide and rifampin regimen is used, patients should be informed of the potential for hepatotoxicity and certain precautions should be taken to ensure that the patient is closely monitored for adherence, tolerance, and adverse effects throughout the entire course of therapy. Pyrazinamide is administered orally. The fixed-combination preparation containing isoniazid, rifampin, and pyrazinamide (Rifater®) should be given either 1 hour before or 2 hours after a meal with a full glass of water. In the treatment of clinical tuberculosis, pyrazinamide should not be given alone. The drug is considered a first-line agent for the treatment of all forms of tuberculosis, and usually is used in the initial phase of treatment. Therapy for tuberculosis should be continued long enough to prevent relapse. The minimum duration of treatment currently recommended for patients with culture-positive pulmonary tuberculosis is 6 months (26 weeks), and recommended regimens consist of an initial intensive phase (2 months) and a continuation phase (usually either 4 or 7 months). However, completion of treatment is determined more accurately by the total number of doses and is not based solely on the duration of therapy. For information on general principles of antituberculosis therapy and recommendations regarding specific multiple-drug regimens and duration of therapy. The manufacturer states that the usual dosage of pyrazinamide for use in conjunction with other antituberculosis agents for the treatment of active tuberculosis is 15-30 mg/kg (up to 3 g) once daily or 50-70 mg/kg twice weekly. 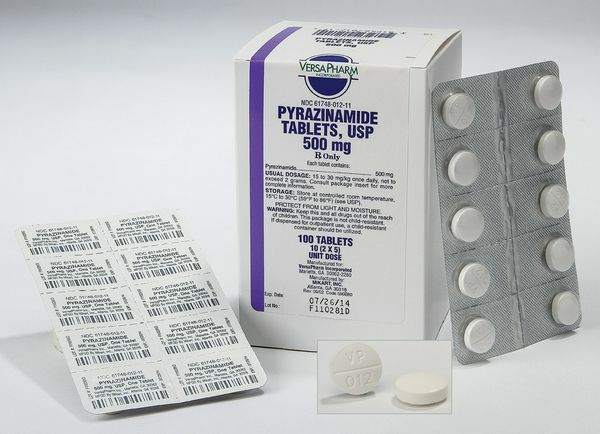 The American Thoracic Society (ATS), US Centers for Disease Control and Prevention (CDC), and the Infectious Diseases Society of America (IDSA) recommend that when pyrazinamide is used in conjunction with other antituberculosis agents in a daily regimen, adults and children 15 years of age or older weighing 40-55 kg should receive a dosage of 1 g, those weighing 56-75 kg should receive 1.5 g, and those weighing 76-90 kg should receive 2 g. The maximum dosage recommended by these experts for a daily regimen is 2 g.
If pyrazinamide is used in an intermittent regimen that involves twice-weekly administration of antituberculosis agents, the ATS, CDC, and IDSA recommend that adults and children 15 years of age or older weighing 40-55 kg should receive a pyrazinamide dosage of 2 g, those weighing 56-75 kg should receive 3 g, and those weighing 76-90 kg should receive 4 g; the maximum pyrazinamide dosage for this regimen is 4 g regardless of weight. If a 3-times weekly regimen is used, adults weighing 40-55 kg should receive a pyrazinamide dosage of 1.5 g, those weighing 56-75 kg should receive 2.5 g, and those weighing 76-90 kg should receive 3 g; the maximum dosage for this regimen is 3 g .
Although safe use of pyrazinamide in children has not been definitely established, the ATS, CDC, and IDSA recommend a pediatric dosage of 15-30 mg/kg (up to 2 g) daily and the American Academy of Pediatrics (AAP) recommends a dosage of 20-40 mg/kg daily (up to 2 g). If an intermittent treatment regimen is used, these experts recommend a pediatric dosage of 50 mg/kg (up to 2 g) twice weekly. When pyrazinamide is administered as the fixed combination containing isoniazid, rifampin, and pyrazinamide (Rifater®) in the initial phase (e.g., initial 2 months) of multiple-drug therapy for pulmonary tuberculosis, the manufacturer states that the adult dosage of Rifater® given as a single daily dose is 4 tablets (480 mg of rifampin, 200 mg of isoniazid, 1.2 g of pyrazinamide) in patients weighing 44 kg or less, 5 tablets (600 mg of rifampin, 300 mg of isoniazid, 1.5 g of pyrazinamide) in those weighing 45-54 kg, and 6 tablets (720 mg of rifampin, 300 mg of isoniazid, and 1.8 g of pyrazinamide) in patients weighing 55 kg or more. In individuals weighing more than 90 kg, additional pyrazinamide should be given in conjunction with the fixed-combination preparation to obtain an adequate dosage of this drug.The ratio of the drug doses in this combination product may not be appropriate in children or adolescents younger than 15 years of age because of the higher mg/kg doses of isoniazid usually given in children compared with those given in adults. Because of the risk of hepatotoxicity, rifampin and pyrazinamide regimen should be used with caution and only in selected individuals with close clinical and laboratory monitoring. To facilitate clinical assessment and laboratory monitoring of serum concentrations of AST (SGOT) and bilirubin at baseline and at 2, 4, 6, and 8 weeks, no more than a 2-week supply of rifampin and pyrazinamide should be dispensed at a time. (See Cautions: Precautions and Contraindications.) The American Academy of Pediatrics (AAP) states that the 2-month rifampin and pyrazinamide regimen is not recommended for children. When a 2-month daily regimen of pyrazinamide and rifampin is used for the treatment of latent tuberculosis infection when the potential benefits of the regimen outweigh the risk of severe liver injury and death (see Tuberculosis: Latent Tuberculosis Infection, in Uses), the ATS, CDC, and the Prevention of Opportunistic Infections Working Group of the US Public Health Service and Infectious Diseases Society of America (USPHS/IDSA) recommend that adults receive a pyrazinamide dosage of 15-20 mg/kg (up to 2 g) daily given in conjunction with rifampin. This daily regimen should consist of at least 60 doses administered within 3 months (allowing for minor interruptions in the 2-month regimen). If an intermittent (twice-weekly) regimen of pyrazinamide and rifampin is used for the treatment of latent tuberculosis infection when the potential benefits outweigh the risk of severe liver injury and death, the ATS and CDC recommend that adults receive a pyrazinamide dosage of 50 mg/kg (up to 4 g) given twice weekly for 2-3 months in conjunction with rifampin. If this intermittent regimen is used, it should be given using directly observed therapy (DOT). The most frequent adverse effect of pyrazinamide is hepatotoxicity. Transient increases in serum aminotransferase (transaminase) concentrations, jaundice, hepatitis, and a syndrome of fever, anorexia, malaise, liver tenderness, hepatomegaly, and splenomegaly have been reported in patients receiving pyrazinamide. Rarely, acute yellow atrophy of the liver and death have occurred. Hepatotoxicity appears to be dose related and may occur at any time during therapy. With a dosage of 3 g daily, hepatotoxicity occurs in approximately 15% of patients, and jaundice occurs in 2-3%. Studies in adults with active tuberculosis indicate that the incidence of drug-induced adverse hepatic effects in patients who receive 25-35 mg/kg of pyrazinamide daily in the initial phase (i.e., first 2 months) of isoniazid and rifampin therapy is the same as that in patients who receive isoniazid and rifampin therapy without pyrazinamide. Pyrazinamide inhibits renal excretion of urates, frequently resulting in hyperuricemia. This effect is usually asymptomatic, but acute gout has occurred in some patients. Nongouty polyarthralgia, which appears to be related to increased serum uric acid concentrations, reportedly occurs in up to 40% of patients receiving pyrazinamide. Uricosuric agents administered concurrently may reduce pyrazinamide-induced hyperuricemia; however, if hyperuricemia is severe or is accompanied by acute gouty arthritis, pyrazinamide should be discontinued and not resumed. Mild arthralgia and myalgia have been reported frequently with pyrazinamide therapy. Maculopapular rash, fever, acne, porphyria, dysuria, interstitial nephritis, and photosensitivity with reddish-brown discoloration of exposed skin have been reported rarely with pyrazinamide therapy. Hypersensitivity reactions, including rash, urticaria and pruritus, also have been reported. GI disturbances including nausea, vomiting, and anorexia also have occurred in patients receiving the drug. Thrombocytopenia and sideroblastic anemia with erythroid hyperplasia, vacuolation of erythrocytes, and increased serum iron concentrations have occurred rarely with the drug. Adverse effects on blood clotting mechanisms also have been reported rarely. Pyrazinamide is contraindicated in patients with severe hepatic damage, acute gout, and in patients with known hypersensitivity to the drug. Pyrazinamide should be used only when close observation of the patient is possible. Serum AST (SGOT), ALT (SGPT), and uric acid concentrations should be determined prior to and every 2-4 weeks during pyrazinamide therapy. Patients should be advised about the initial symptoms of hepatitis (e.g., fatigue, nausea, abdominal pain, anorexia) and the importance of discontinuing therapy and contacting their clinician should such symptoms develop. Pyrazinamide should be used with caution in patients with renal failure or a history of gout. The drug should also be used with caution in diabetics because the management of diabetes mellitus may become more difficult during pyrazinamide therapy. Because of reports of liver injury (including fatalities) when regimens containing pyrazinamide and rifampin were used in patients with latent tuberculosis infection, these regimens generally should not be offered to HIV-infected or HIV-negative patients. Regimens containing pyrazinamide and rifampin should be considered for the treatment of latent tuberculosis infection only when the potential benefits outweigh the risk of liver injury and death; when the preferred or alternative regimens (i.e., 9-month isoniazid regimens, 6-month isoniazid regimens, 4-month daily rifampin regimen) are judged unlikely to be completed; and when oversight can be provided by a clinician with expertise in the treatment of latent tuberculosis. A pyrazinamide-rifampin regimen should never be offered to patients who are currently taking other drugs associated with liver injury, patients who drink excessive amounts of alcohol (even if alcohol is discontinued during treatment), or patients with underlying liver disease or a history of isoniazid-associated liver injury. An expert in the treatment of latent tuberculosis should be consulted before a regimen of pyrazinamide and rifampin is offered. 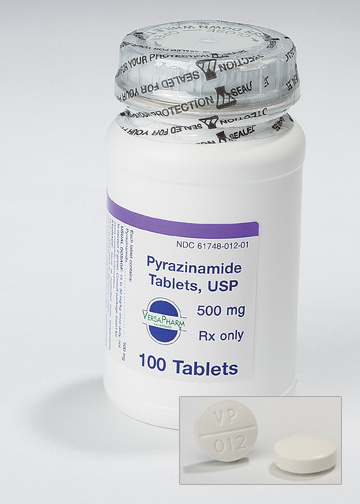 Individuals being considered for a 2-month pyrazinamide-rifampin regimen should be informed of potential hepatotoxicity, questioned regarding prior liver disease or history of adverse effects during treatment with isoniazid or other drugs, and cautioned against the concurrent use of potentially hepatotoxic drugs (including OTC drugs such as acetaminophen). If a decision is made to use a pyrazinamide-rifampin, serum AST and bilirubin concentrations should be measured at baseline and at 2, 4, 6, and 8 weeks and patients should be reassessed in person by a health-care provider at 2, 4, 6 and 8 weeks for adherence, tolerance, and adverse effects. To facilitate these periodic assessments, no more than a 2-week supply of the drugs should be dispensed at a time. Patients should be instructed to discontinue the pyrazinamide-rifampin regimen immediately and seek clinical consultation if abdominal pain, emesis, jaundice, or other manifestations of hepatitis develop. The drugs should be discontinued and not reinitiated in asymptomatic patients who have an AST concentration exceeding 5 times the upper limit of normal, in patients with symptoms of hepatitis who have an AST concentration exceeding the upper limit of normal, and in patients who have serum bilirubin concentrations exceeding the upper limit of normal (regardless of the presence or absence of symptoms). Pyrazinamide appears to be well tolerated in children; the American Academy of Pediatrics (AAP) states that in dosages of 30 mg/kg daily or less, the drug is well-tolerated and seldom hepatotoxic. Safety and efficacy of the fixed-combination preparation containing rifampin, isoniazid, and pyrazinamide (Rifater®) have not been established in children younger than 15 years of age; the ratio of rifampin and isoniazid contained in this preparation may not be appropriate in this age group since higher doses of isoniazid usually are used in pediatric patients. Clinical studies of pyrazinamide did not include sufficient numbers of patients 65 years of age or older to determine whether they respond differently than younger adults. Other reported clinical experience has not identified differences in responses between geriatric and younger adults. In general, dosage of pyrazinamide for geriatric patients should be selected carefully starting at the low end of the dosage range because these individuals frequently have decreased hepatic and/or renal function and concomitant disease and drug therapy. Pyrazinamide was not mutagenic in the Ames microbial (Salmonella) mutagen test, but it did induce chromosomal aberrations in human lymphocyte cell cultures. Pyrazinamide reportedly was not carcinogenic in rats or male mice (as determined in lifetime bioassays) when administered in daily doses of approximately 10-40 times the maximum recommended human dose; results in female mice could not be determined because of insufficient numbers of surviving mice in the control group. Animal reproduction studies have not been performed with pyrazinamide, and it is also not known whether the drug can cause fetal harm when administered to pregnant women or whether it can affect reproduction capacity. Pyrazinamide should be used during pregnancy only when clearly needed. The American Thoracic Society (ATS), US Centers for Disease Control and Prevention (CDC), and Infectious Diseases Society of America (IDSA) state that routine use of pyrazinamide in pregnant women is not recommended. However, the benefits of pyrazinamide may outweigh the possible (but unquantified) risk in some pregnant women with tuberculosis, especially when resistance to other drugs but susceptibility to pyrazinamide is likely. Because pyrazinamide is distributed into milk in small amounts, a decision should be made whether to discontinue nursing or the drug, taking into account the importance of the drug to the woman. Pyrazinamide may be bacteriostatic or bactericidal in action, depending on the concentration of the drug attained at the site of the infection and the susceptibility of the infecting organism. In vitro and in vivo, the drug is active only at a slightly acidic pH. The exact mechanism of action of pyrazinamide has not been fully elucidated. The antimycobacterial activity of pyrazinamide appears to partly depend on conversion of the drug to pyrazinoic acid (POA). Susceptible strains of Mycobacterium tuberculosis produce pyrazinamidase, an enzyme that deaminates pyrazinamide to POA, and the in vitro susceptibility of a given strain of the organism appears to correspond to its pyrazinamidase activity. In vitro studies indicate that POA has specific antimycobacterial activity against M. tuberculosis. In addition, the fact that POA lowers the pH of the environment below that which is necessary for growth of M. tuberculosis appears to contribute to the drug’s antimycobacterial activity in vitro. Pyrazinamide is a highly specific agent and is active only against Mycobacterium tuberculosis. Results of in vitro susceptibility testing with pyrazinamide are affected by the test media, inoculum size, and pH. In vitro, in media with a pH of 5.5, the minimum inhibitory concentration (MIC) of pyrazinamide for M. tuberculosis is generally less than 20 mcg/mL. In one in vitro study in 7H12 liquid media, MICs of the drug reported for M. tuberculosis were 50 mcg/mL at pH 5.5 and 400 mcg/mL at pH 5.95. Natural and acquired resistance to pyrazinamide have been demonstrated in vitro and in vivo in strains of M. tuberculosis. Resistant strains of initially susceptible organisms develop rapidly if pyrazinamide is used alone in the treatment of clinical tuberculosis. When pyrazinamide is combined with other antituberculosis agents in the treatment of the disease, emergence of resistant strains may be delayed or prevented. Although the exact mechanism(s) of resistance to pyrazinamide has not been determined, some strains of pyrazinamide-resistant M. tuberculosis do not appear to produce pyrazinamidase and therefore cannot convert the parent drug to pyrazinoic acid (POA), its microbiologically active metabolite. There is no evidence of cross-resistance between pyrazinamide and other antituberculosis agents currently available in the US. Pyrazinamide is well absorbed from the GI tract. Following a single 500-mg oral dose in healthy adults, peak plasma concentrations of pyrazinamide ranging from 9-12 mcg/mL are attained within 2 hours; plasma concentrations of the drug average 7 mcg/mL at 8 hours and 2 mcg/mL at 24 hours. Plasma concentrations following doses of 20-25 mg/kg reportedly range from 30-50 mcg/mL. Plasma concentrations of pyrazinoic acid, the major active metabolite of pyrazinamide, generally are greater than those of the parent drug and peak within 4-8 hours after an oral dose of the drug. In a single-dose study in healthy fasting males, the extent of absorption (as measured by area under the plasma concentration-time curve) of isoniazid, rifampin, or pyrazinamide in dosages of 250, 600, or 1500 mg, respectively, was similar whether the drugs were administered individually as capsules (rifampin) and tablets (isoniazid and pyrazinamide) or as a fixed combination containing isoniazid 50 mg, rifampin 120 mg, and pyrazinamide 300 mg per tablet. Pyrazinamide is widely distributed into body tissues and fluids including the liver, lungs, and CSF. In a limited number of adults with tuberculous meningitis, mean serum and CSF concentrations of pyrazinamide 2 hours after an oral dose of approximately 41 mg/kg were 52 and 39 mcg/mL, respectively. Within 5 hours after an oral dose, CSF concentrations of pyrazinamide are reported to be approximately equal to concurrent plasma concentrations of the drug. Plasma protein binding of pyrazinamide (determined by ultrafiltration) in a limited number of healthy men averaged approximately 17% at a pyrazinamide concentration of 20 mcg/mL. It is not known if pyrazinamide crosses the placenta. It is not known if pyrazinamide is distributed into milk. The plasma half-life of pyrazinamide is 9-10 hours in patients with normal renal and hepatic function. The plasma half-life of the drug may be prolonged in patients with impaired renal or hepatic function. Pyrazinamide is hydrolyzed in the liver to pyrazinoic acid, the major active metabolite; some hydrolysis may also occur in the stomach and bladder. Pyrazinoic acid is hydroxylated to 5-hydroxypyrazinoic acid, the major excretory product. Within 24 hours, approximately 70% of an oral dose of pyrazinamide is excreted in urine, mainly by glomerular filtration. About 4-14% of the dose is excreted as unchanged drug; the remainder is excreted as metabolites. Pyrazinamide, a derivative of niacinamide, is a synthetic antituberculosis agent. The drug occurs as a white to practically white, odorless or practically odorless, crystalline powder and is sparingly soluble in water and slightly soluble in alcohol. Pyrazinamide has a pKa of 0.5. Pyrazinamide is commercially available alone and in fixed combination with isoniazid and rifampin. Pyrazinamide tablets should be stored in well-closed containers at 15-30°C. Tablets containing the fixed combination of rifampin, isoniazid, and pyrazinamide (Rifater®) should be protected from excessive humidity and stored at 15-30°C.